Addiction treatment seeks to help you end your bad behaviors and replace them with healthy habits instead. Part of addiction treatment is learning a new way to live, giving you the skills and tools you need to rebuild a happy, healthy, successful and meaningful life in sobriety. Alcohol and substance use disorders disrupt each aspect of life, which is why it’s important to pay attention to all aspects of life when it comes to healing from drug abuse. Royal Life Centers at Sound Recovery encourages guests to make healthy habits a routine, for lasting sobriety. We use intensive therapies, including behavioral therapies, to give guests the tools they need to rebuild their lives in a healthy and positive way. Part of a healthy lifestyle is having healthy routines, like regular visits with a therapist to manage mental health, physical wellness activities and more. Royal Life Centers at Sound Recovery makes it easy for our guests to thrive with full healing and health. We promote health in the mind, body, and spirit for a recovery from addiction. You need to feed your body, especially in the morning, because food translates to fuel and will help you be more alert and awake through out the day. Breakfast time is especially important to help you get your day started! Try eating a well-balanced breakfast in the morning, full of whole grains, protein, carbs, and minimal sugar. Your body will thank you for the nutrients, and you will successfully fuel your body to tackle the day with energy. It is proven that waking up and practicing mindfulness will help boost your brainpower, stay focused, handle stress better, and improve your relationships. Waking up and having quiet time to yourself to meditate, read, or create a list of goals for the day is the perfect practice to add to your morning routine. You could even play your favorite music as you drink your coffee or eat breakfast. Putting yourself in a positive state of mind will do wonders for how the rest of your day will unfold. Even just stretching lightly for about 15 minutes in the morning will help to improve your blood circulation, wake you up, and release endorphins. Exercising through out your day will also keep you feeling good, productive, and happy! 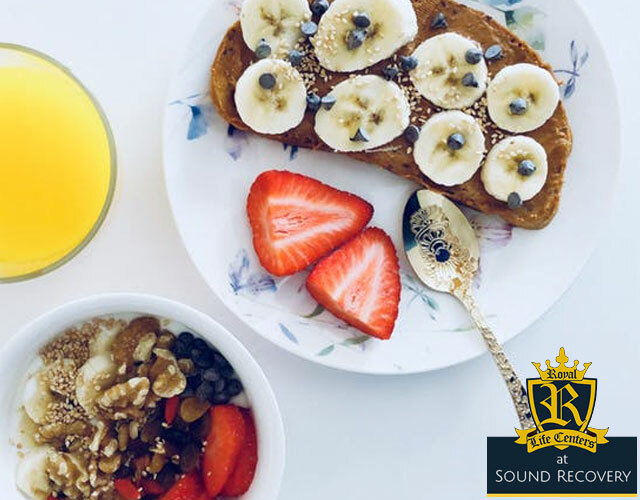 Often times, those who were addicted to drugs or alcohol will neglect physical wellness, which is why it’s important to adopt this healthy habit as you are working on whole body health in Royal Life Centers at Sound Recovery. Waking up even just a half hour early will leave you some time for yourself in the morning. No one likes to rush, so even just those extra 30 minutes will make a world of difference for you in your day. Take time to take care of yourself in the morning, whether that be meditating or just sitting quietly for a half hour while you wake up. You will appreciate the extra 30 minutes you get, and will feel mentally and physically ready to take on the day. Try making an action list to kick start your day. Write down three things that you can do for the day, that bring you closer to your goals. This goal-setting activity will make you feel productive and give you guidance through out the day. You can also try writing a list of five things you are grateful for, which is a gratitude list. Making a gratitude list will put you in a great mindset each morning, which leads to a day full of positivity. These are some great ways to start your day, but there are so many other things you can do to get the most of your day. Stay productive by revisiting the goals you wrote that morning, follow up with some physical wellness activities, and continue your mindfulness. It’s especially important for those with a dual diagnosis like depression and anxiety to check in with themselves in the morning and through out their day. Health is more than just what you eat or how much you exercise, health relies on healthy habits and routines that will continue to provide wellness in the mind, body, and spirit. Treating alcohol and substance abuse is more than just not picking up a drink or drug, it’s about learning a new way to live. Royal Life Centers at Sound Recovery provides the highest standards of addiction treatment with our aftercare options. Royal Life Centers at Sound Recovery has treatment options including: our partial hospitalization program (PHP), an intensive outpatient program (IOP), an outpatient program (OP), sober living and graduate housing. All of our programs support long term and lasting sobriety. Royal Life Centers also has short term treatment programs including a medical detox and a residential inpatient program. Our treatment programs use intensive therapies for addiction recovery. We provide individual therapy sessions, group therapy, adventure therapy, activity therapy, and equine therapy. Upon request, we can also invite family members to partake in family therapy with their loved ones. If you are looking for a treatment center near you, please click here to see a list of our locations. If you or someone you know is struggling with an addiction, please don’t hesitate in reaching out to us at (877)-RECOVERY or (877)-732-6837. Our team of addiction specialists make themselves available to take your call 24 hours a day, 7 days a week. We are always available to help support and guide you to the recovery process. Because We Care.